Sitting under the stars by a crackling fire or entertaining friends and family in the backyard or around the pool creates wonderful memories that last a lifetime and bring everyone together. But they also bring an increased risk of home fires and burn injuries. With a few safety tips, you can prevent these accidents. · Check with the fire department for any restrictions before starting an open air, recreational, or outdoor cooking fire. Obtain proper permits, if required. You might not be permitted to do outdoor burning in some municipalities and during some seasons. · Closely supervise all outdoor fires. Make sure the fire is out before leaving. 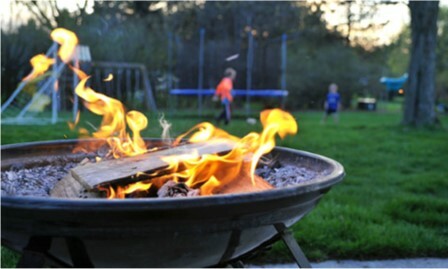 · Supervise children around any fire outdoors, including campfires, fire pits and outdoor fireplaces. · Permitted open fires need to be at least 50 feet from anything that can burn. · Permitted recreational fires need to be at least 25 feet away from anything that can burn. · Avoid burning on windy, dry days. When conditions are windy or dry, it is easy for open burning to spread out of control. · Where outdoor burning is allowed, never use gasoline or other flammable or combustible liquids. · When burning, have a hose, bucket of water, or shovel and dirt or sand nearby to extinguish the fire. · Clear away dry leaves and sticks, overhanging low branches and shrubs. can grow into a damaging fire. · Keep a campfire small which is easier to control. · Never use gasoline or other flammable or combustible liquids. · Fire pots, personal fireplaces, and patio torches are considered open flames and use gel fuel. Gel fuel is highly flammable. Extreme caution should be taken when using or adding fuel. · Use chimineas, outdoor fireplaces, and fire pits outdoors only and at least 10 feet away from the home or anything that can burn. · Never leave a lit pot or personal fireplace, or torch unattended. · Place the fire pot or personal fireplace on a sturdy surface. · Make sure patio torches are secure and not in the path of people or pets. · Be careful reaching over the devices—clothing or hair could catch fire. · Use only gel fuel to refuel. · Citronella fuel is intended for outdoor use only. a device that is not completely cool may result in a fire or injury. · If gel fuel is spilled on clothing, remove the clothing and launder immediately. · Store the gel fuel in its tightly sealed container away from heat sources and out of reach of children and pets. · Stop, drop, and roll may not put out clothing that catches fire from splattered or spilled gel fuel. A drychemical portable fire extinguisher can be used to extinguish the fire.